Can be instantly accessed from any place in the world. It is equivalent to a bank vault. The medical records kept intelligently in the vault on the web will give you and your doctors holistic feedback on your health condition. No more looking for CT scans, X-rays, blood reports in long forgotten places. A unique feature of Med Docket™ is the ALERT signals that will be received if any changes are noticed in your/your loved ones health curve. For personnel with preexisting conditions, Med Docket™ facilitates in monitoring the disease. In addition, by sending early alerts, Med Docket™ helps prevent any imminent complications. Disease is an uninvited guest and access to medical information can be the deciding factor between life and death. Having your records organized in a single convenient location can provide you/the doctor with key information in the time of crisis. 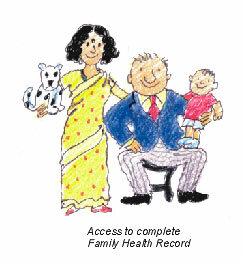 Med Docket™ - ensures easy health information access to you and your family even when you travel. Med Docket™ - assists you and your family's progress towards specific health related goals. 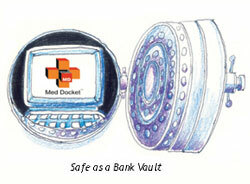 Med Docket™ - keeps your medical records safe and secure. You can nominate two people who will be contacted should an emergency arise. Only after an expedited thorough verification shall your health data be disclosed to the nominee. In addition, the nominee can only view your medical information. At no point will any alterations by the nominee be allowed.